Coffret D’or goes sweet and noble with the release of the upcoming party palettes. I reckon its for the holiday season. There are 2 palettes – Sweet Dressy and Noble Dressy. Sweet Dressy is, as the name implies, to impart a sweet look. The slim palette contains 6 colours – 3 powder eyeshadows and 3 lipstick and lipgloss combinations. The eyeshadows are in the pink-purple family which is favoured by the Japanese for a sweet look. The lipsticks are quite a deep shade with a sparkly lipgloss to round off the look. Knowing the Japanese style of lipsticks, they would be sheer – just how I like it. I’m quite taken in with the middle colour of the Sweet Dressy eyeshadow palette – it looks like a nice silvery tone. Noble Dressy has a more neutral look with neutral shadows and more muted lipstick with gold toned lip gloss. The deepest colour of the Noble Dressy eyeshadow palette has my attention but the lipsticks don’t grab me. I prefer a rosier tone to an orangy tone of lipstick. The eyeshadows come in a slim case – reminds me of the Lavshuca Summer Gradually palette. I wonder if its the same small size. I don’t know how much it’ll cost but I estimate it at approx RM120 or thereabouts. I don’t know if I’ll get it. I don’t play well with pink/purple tones on the eyes but the lip colour appeals to me. 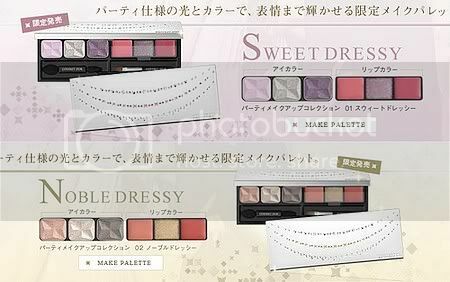 On the other hand, the neutral palette looks nice for the eyes but the lip colours don’t appeal. Wish there was a way I could mix and match. even a full e/s palette would be nice! but that’d look like shu’s don’t you think? Those look pretty, but I think I’ve fulfilled my quota of pink and purple eyeshadows! The names are hilarious, though…noble dressy-haha! @plue : I guess because eyeshadow can also be blush! I think they are trying to be more versatile.